Thin Ice is set on, under or about the River Thames in 1814. There is a Frost Fair taking place. These were an actual thing back when the Little Ice Age meant that British winters were a little more severe than they are now, so the Thames froze over solidly enough to allow a fair to set up on its surface. Let’s skip for the moment that he has shown his outrage before. I immediately thought of the Fourth Doctor’s ‘But what’s it for!’ in ‘The Pirate Planet.’ However, the Doctor’s outrage – and anger – I think is a colder thing than most. It’s displayed by the way he will take apart the plans of the people that have driven him to outrage. Indeed, I might argue that outrage is often the Doctor’s motivating force. It’s just he doesn’t often need to express it out loud. For the Doctor outrage is action. The moment is broken though and instead of this conversation being taken further we get back to investigating what’s going on. And this it will turn out is exploitative capitalism. Bill has flagged up earlier that slavery is still a thing in 1814 – which it is in the British Empire but not in Britain itself at this point. And it turns out that this is the story of slavery. Except instead of human slaves we have one big fish whose poo turns out to be a rather useful fuel for the factories of Lord Sutcliffe. The side effect of this is that the big fish needs to be fed. And it hasn’t eaten enough for a while. Hence the people disappearing. Lord Sutcliffe (Nicholas Burns) is both the ugly face of capitalism and a racist. His response to Bill is ugly in the extreme. And the Doctor punches him. Hard. I must admit that I cheered at that point on the original watch. A Doctor who punches racists is my kind of Doctor. I’m sure others feel it is yet another example of Doctor Who being overwhelmed by political correctness. The thing is the punch is followed by a short and rather lovely speech, which even Sutcliffe comments on revealing his utter lack of compassion. Yes, Sutcliffe is a bit of a two-dimensional baddie, but it is nice for the Doctor to come up against one of those every so often. You know that he’s irredeemable and is doomed to an unpleasant end from that moment. Nicholas Burns does a lovely job of making him feel like a sneer in human form. Sutcliffe’s plan is to basically blow up a load of dynamite, shatter the ice and feed his incredible pooing fish a massive meal, which will keep him and his factories in fuel for the foreseeable future. It’s a novel, if unsubtle, plan. It fails. Naturally. There’s a moment, like that between the Doctor and Clara in ‘Kill the Moon’, where the Doctor asks Bill to make the decision on what they do next and I’m not sure this is something I like. He doesn’t do it all the time. It just seems to be something he does when writers feel the need to ratchet up the tension a bit. Either the Doctor serves at the pleasure of humanity all the time or he’s doing his own thing. Now, I admit in both these cases he’s had time to think before deciding but still it just seems to go against the grain for me. It’s a nice little story this. The setting is fun. There are some meaty scenes about big issues and Capaldi and Mackie are rather brilliant. Again. Honestly, what my re-watch has done is remind me how brilliant Pearl Mackie and Bill Potts is. After Donna I think she’s the best companion of the ‘new’ Doctor Who era. 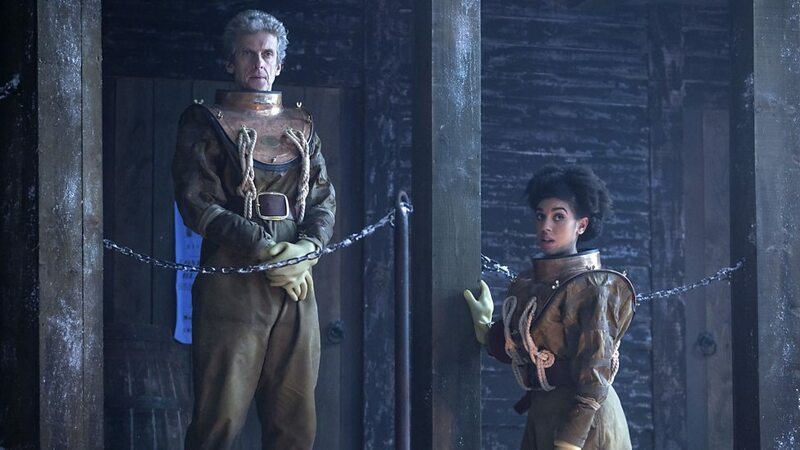 Pearl Mackie’s doing a great job too. 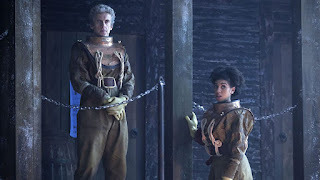 So, this I think is my favourite story of Series 10 so far. Next up ‘Knock Knock’.